Less than five years after erecting a bust of America's 40th president in a park, Hungary's capital is honoring Reagan with a full statue in Freedom Square, just a couple blocks from parliament and home to the U.S. Embassy. 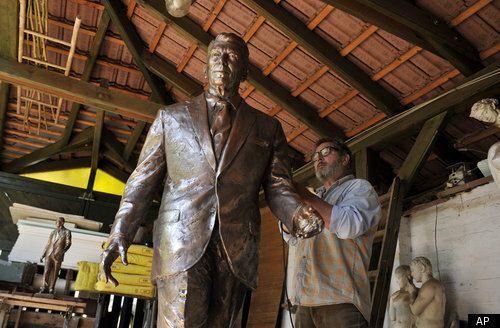 The bronze 2-meter (7-foot) likeness, placed on a thin block of granite, shows Reagan in mid-stride, making it seem as if he's is taking a walk in the square. "The statue is meant to reflect the ease he had in connecting with people and his close relationship with them," sculptor Istvan Mate told The Associated Press as he put the finishing touches on the statue in his workshop in Csongrad, a small town 150 kilometers (93 miles) southeast of Budapest. Mate modeled his statue on a series photographs and has depicted Reagan wearing a suit and moccasins. His hands are open so people will be able to pretend they are locked in a handshake with the former actor and California governor. Hungarian Prime Minister Viktor Orban recently wrote about Reagan's "undying merits" in the liberation of Europe from Soviet dictatorship. "In the 1980s, he gave us hope that despite the difficulties we should persist in the struggle for freedom and independence," Orban wrote in the foreword to a book about the U.S. president. 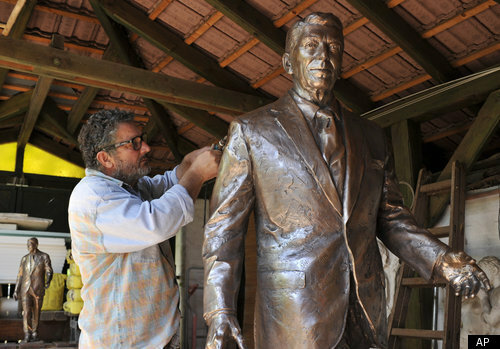 The new statue will be unveiled Wednesday by Orban and numerous dignitaries from the United States, including former secretary of state Condoleezza Rice and Ed Meese, attorney general during the Reagan administration. The event is part of a series of commemorations of the 100th anniversary of Reagan's birth being held across Europe — including a memorial mass Monday in Krakow, Poland, and the renaming of a street after Reagan in Prague, the Czech capital. Mate has more than 140 works on display around Hungary — many of them done in collaboration with his wife, Gyorgyi Lantos — but the Reagan statue will be his first in Budapest. Mate had to work fast to meet his deadline, first preparing a mold from a clay model sculpted around a metal core, then casting seven separate bronze pieces weighing a total of 180 kilograms (400 pounds) and welding them together. "It was a big challenge to prepare a statue of the president of the United States, the world's leading power," Mate said. "It will be a relief to finally see it in its place." Reagan's statue is being placed on Freedom Square near a more disputed landmark, a 1945 memorial to Soviet soldiers killed during the ouster of the Nazis at the end of World War II. Many Hungarians see it as a reminder of Soviet rule and would like to have the 15-meter-high (50 feet) obelisk moved to a less prominent location. 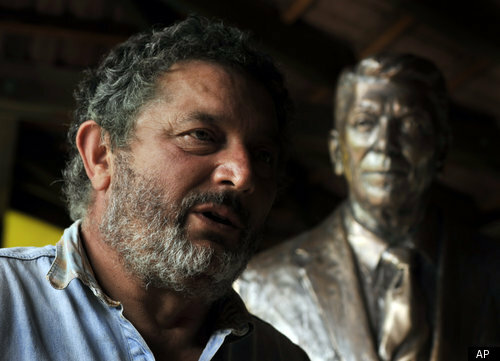 Marton Baranyi, the co-creator of a Hungarian website dedicated to Reagan, says the new sculpture's proximity could change how the Soviet memorial is perceived. "Reagan will be like David walking past Goliath," said Baranyi, a 24-year-old journalist and sociology student. "The place will have a new meaning and a new atmosphere."